What are its artists� social, political and formal impulses? What is hybridity and why? What are the sector�s economy, context and public? 1) 8 Days of intensive workshop with Anna Furse, who will introduce the participants to her methodology for preparation for creative performance making. It will combine intensive physical training, ensemble techniques, image building, working with space and scenography, structure and composition. Participants may come from a wide range of background and experiences but each must be prepared to commit to the entire process, participate fully on all the training work and be ready to bring ideas and work collaboratively and independently during the project towards the performance. The participants will have to produce a performance as a result of the workshop. This will be directed by Furse as a dramaturgy devised from participants� own creative exercises based on a common enquiry and topic. There will be free entrance at the performance presentations. Students of Dance, Art, Drama Schools/Universities. Artists with different backgrounds (actors, dancers, musicians etc). Those who have been involved in performance making or want to be involved. The number of the participants in the workshop is limited. The number and the type of the final performances will be decided regarding the number and the intentions of the participants. The participation will be submitted electronically, by sending a short CV* (mandatory) in english along with the participation form at production-dept@mcf.gr with the subject «PMIL-Participation-(your name)», until Tuesday 28th of June 2016. The final selection will be made by a commission of dance and art professionals. The candidates will receive a confirmation by email that their participation interest has been submitted. After the completion of the workshop, certificate of attendance will be provided to the participants. The workshop will be presented in English. 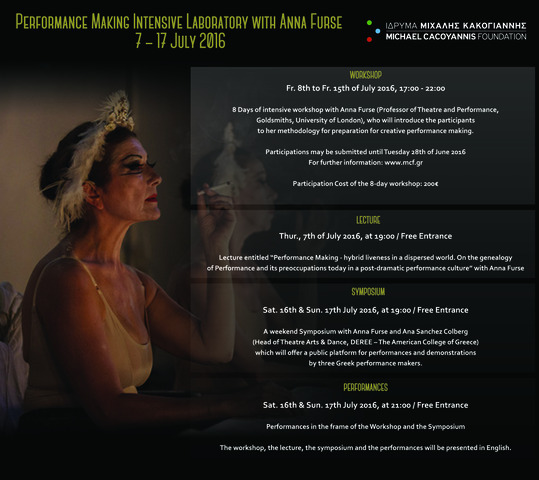 2) Lecture entitled �Performance Making - hybrid liveness in a dispersed world. On the genealogy of Performance and its preoccupations today in a post-dramatic performance culture� with Anna Furse, who will introduce and frame these questions. The entrance to the lecture is free to the audience and is intended for those who are interested in performance making (artists, researchers, academics etc.) and wish to approach the theoretical frame of the mentioned questions. The lecture will be presented in English. 3) A weekend Symposium with Anna Furse and Ana Sanchez Colberg (Head of Theatre Arts & Dance, DEREE � The American College of Greece) which will offer a public platform for performances and demonstrations by three Greek performance makers. The entrance to the Symposium is free to the audience and will be presented in English. b. The public platform for performance in Greece nowadays in the frame of the 2-day Symposium. (Three Greek artists will present their work, which will be the foundation for further discuss at the Symposium). Anna Furse is Professor of Theatre and Performance at Goldsmiths where she was Head of Department until 2015. For 15 years she has directed the internationally renowned MA in Performance Making � a laboratory programme bringing dancers, theatre artists and fine artists into hybrid performance study, research and creative practice. She is also Co-Director of the interdisciplinary research hub The Centre of the Body. Her award-winning career in professional theatre covers 33 years as an auteurial director, writer and curator. Developing her own performance making language that synthesises her original training in the Royal Ballet and her work with Peter Brook, Grotowski and post-modern dance, her Artistic Directorships include BloodGroup (1980 � 86) and Paines Plough (1990 -95). Founding her company Athletes of the Heart in 2003 with a Wellcome Trust Award, she has developed a range of art/medicine collaborations with 2 hospitals, health organisations and international venues and international co-productions with Serbia and Slovenia. Most recent production includes When We Were Birds at the Cantieri Culturali Zisa, Palermo, Live Collision Dublin and GIFT festivals, and an installation for the Freud Museum Mad, Bad and Sad programme 2013 � 2014. Her book Theatre in Pieces � Politics, Poetics and Interdisciplinary Collaboration (Methuen 2011) is an innovative anthology of experimental performance texts, including Peter Brook�s iconoclastic US from 1966 and her own Don Juan.Who?/?Don Juan.Kdo? with Mladinsko Gledalisce, Ljubljana. Her new performance work in progress The Anatomy Act is a collaboration with musician David Coulter (collaborator with Laurie Anderson, Jarvis Cocker, Tom Waits and musical director of Black Rider for Robert Wilson), scenographer Mela Dell�Erba (Teatro Garibaldi, Palermo), the Anatomy Departments of Kings College, University of London and Trinity College, Dublin. It is a CAPP EU Residency commissioned by CREATE-Ireland and will premiere at the Live Collision Festival in November. Thanos Vovolis acts as Chair and presents on issues of colonial politics embedded in contemporary arts practices in Greece. He is a Scenographer, Costume and Masking designer, and Artistic Researcher. His work comprises more than 80 theatre productions in Greece, Sweden, Iceland, Spain, Romania. Appointed Visiting Professor at the Dramatic Institute, Stockholm 2007-2010, he is also a co-founder of the Independent Performing Arts Festival �Page_31�, Athens and Curator for the Hellenic National Participation at the Prague Quadrennial of Performance Design and Space 2015. Currently, he teaches Scenography and Costume Design at the Frances Rich School of Fine and Performing Arts at Deree � The American College of Greece.